P1: They hurtled downward until the Earthman clutched a hold. P2: Descending to the street, Carter and Dejah Thoris leaped upon the waiting thoat -- and guided by the faithful Sola, they raced toward the desert, while Woola followed. P3: As the howling warriors saddled their nervous, squealing thoats, the fugitives sped away fromt he ghostly ruins of the ancient city. P4: Tars Tarkas again proved his friendship for Carter by dispatching pursuers in the opposite direction. P5: All night the fugitives traveled and at dawn one of the tired thoats collapsed, unable to proceed farther. P6: Through long, hot days they plodded on across endless miles of desert waste seeking some landmark familiar to the girl. P7: Sola had brought few provisions, but each enjoyed heartily his scant ration at the evening meal. P8: One night Dejah Thoris spoke to the Earthman: "We are lost and the desert will claim us. But you are beside me, warrior of another world, I am unafraid!" 2. Issue #35 of The Funnies continues the story along the lines of ERB's plot, but the Sunday strip does not rejoin this timeline until strip #66. In other words, the Sunday story from the middle of strip #10 to the end of strip #65, is pure JCB innovation, with only the most tangential ties to any of ERB's Mars tales. 3. The final panel in strip #10, where Dejah Thoris says "We are lost..." reproduces Sola's exclamation in The Funnies. ERB's words, in chp. 17 of A Princess of Mars, are: "All the following day we rode, and when, late in the afternoon we had sighted no distant trees, the mark of the great waterways throughout all Barsoom, the terrible truth flashed upon us -- we were lost." In all three versions of the story the escapees are left with only one thoat. The Sunday strip's portrayal of the escaping trio losing one of their two thoats parallels the story told in issue #35 of The Funnies, but that comicbook's explanation of the first thoat having died due to a gunshot wound can be safely dropped from the novelization. 4. Dejah Thoris' words in the final panel of strip #10 disclose too much of her growing affection for Carter. This does not well conform with ERB's original version of the story and subsequent exclamations of this sort on her part should be rendered less blatant in the novelization. CHAPTER 10: "Lost In The Desert"
The life of Captain John Carter, late of Virginia, has been one of many remarkable coincidences. Isolated clouds appear now and then in the skies over Barsoom, but solid sheets of gray, spread across the heavens are a rare sight indeed. As the Earthman and the red princess plunged from the end of the ornamental stone beam, the lesser moon shone through an open patch of sky for just about as long as the telling of it takes. During that brief interval John Carter reached out with the loop of his sword-belt. Then came the shock of collision! The lone rider dropped the warm pistol on the pavement and wheeled his steed into the night. Before long there would be a general rush of the jeds, high chieftains and lower chieftains to the jeddak's palace. He had to ready himself for that moment -- and the for inevitable questions. "Make new water and air!" He spoke aloud, as if his slate gray charger could fathom the feigned conversation. "That notion has led to this -- a dozen of my battlemates dead by my own gunfire. Not in glorious, hand to hand battle, but from the shadows. A water-hearted deception to make an alliance with a water-loving race! Issus!" For the first time in his very long life, the green man had not enjoyed slaughtering his prey. And fact that worried him. "John!" she cried out, but Dejah Thoris had no words to follow her exclamation. She could only hold on with all her strength and peer up through the man's wind-blown locks. The leather strap in the Jasoomian's strong hands had caught upon the sharp broken edge of a time-worn stone carving: they were dangling in the air, rocked by a growing wind. "Hurry, John Carter!" Sola cried out. Since she had first spotted the two humans above her head a full xat [3 minutes] had passed, and it seemed to have taken a full year! The strained leather strap ripped and then broke entirely in two. Again the couple fell downward, but this time the speed and impact were not life-threatening. They landed atop a clump of dense shrubbery. Descending to the ground, Carter and Dejah Thoris walked a few paces, leaped upon the waiting thoat and tore off into the night. All through the vast ruined city of Thark the alarm sounded. The gates were turned shut and every large gun atop the walls was manned. Or, at least that was what was supposed to happen. In fact, only a few of the warriors ran to the walls. Elsewhere a strange mixture of mass confusion and mass indifference prevailed for half the night. The blood raced hot in Dejah Thoris' veins; the stimulation of the narrow escape and their wild passage through the darkened streets was almost more than the princess could have hoped for. Faithful Sola, long familiar with the city, guided them from atop her own fleet-footed mount. Several times they lost sight of her but that mattered not; running thoats can follow a lead charger with unwavering exactness through the darkest nights. Sola slowed her mount and waved back to the humans, signaling caution. They had made it to the southern wall of Thark. Ahead of them was a small, unguarded gate. However a few green citizens were coming and going and Sola thought it best to wait. Along his round-about path back to the palace, Tars Tarkas met with a mounted company of Tal Hajus' guards. They all paused for a moment to exchange information. This troop was on its way to the south gate, searching for two fleeing red men. He told them he had seen two small suspicious looking figures on thoatback, riding toward the north gate. In the dark had thought them young Tharks. The guards tuned and raced northward. At the main entrance to the palace nobody seemed to be in charge and hundreds of excited warriors were milling about. Among the moving mass of olive-skinned bodies he saw Gar Kovas, an old comrade from a hundred far-flung battles. "Did you hear, Tars Tarkas? An attempt was made upon the jeddak's life. He yet lives, however. Some say the attack came by the hand of the Heliumite who was seeking an alliance. But Tal Hajus himself reports ten Thurd assassins and two Zodangan gun-sellers were the attackers. He has killed them all!" A trace of a smile crossed the high chieftain's lips. Then he felt drops of moisture on his ears and cheeks. Spurting blood? The spew of an insult? The big man looked to both sides and then upward into the wind. It was rain -- the first he had ever experienced. "What place is this, John Carter?" the princess asked. Why have we stopped?" The girl was behind the Earthman in the saddle. The view from his position was a better one, but he could only shrug his shoulders in ignorance. The place smelled of death. The entire scene was one of neglect and decay. Then Sola gave the sign to move on. The stench grew much worse as they passed through the small gateway. The area was obviously a refuse dump for the disposal of butchered animal remains. Calots and six-legged rats feasted and then fought one another to feast some more. The riders saw half a dozen green men who had been piling up whitened bones in old handcarts. But the scavengers were shielding their faces from the rising wind and paid no attention to their passing. Once they were safely through the charnel lot the escapees urged their mounts to greater speed and soon Thark was but a dark line behind them on the horizon. The wind died down a little. Then the skies let loose a sprinkle of water. "Rain!" 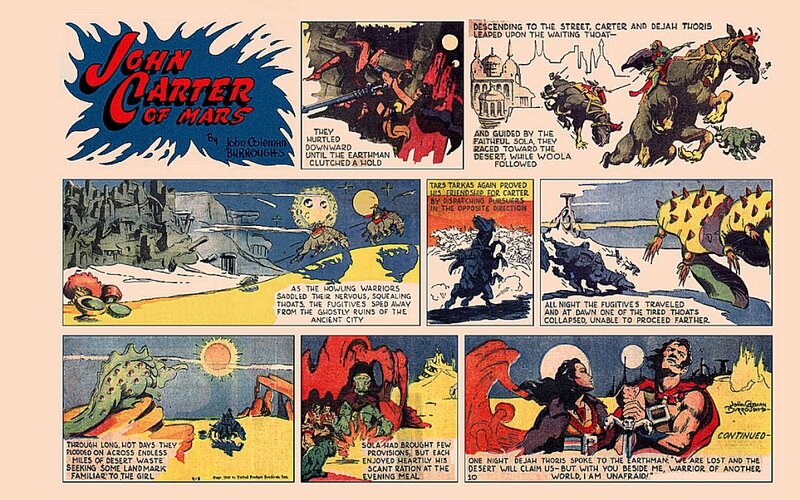 exclaimed John Carter, "the first I've seen on Mars." "And me also," responded Dejah Thoris. "But I have seen frost and snow, which are but frozen forms of the same thing. Isn't it wonderful!" All night the fugitives traveled but just after dawn one of the thoats showed signs of sickness and collapsed. They left it and plodded on, first south for a little while and then east, across endless miles of desert waste. This took them directly opposite the course to Helium, which Sola was certain would soon be overrun with searching warriors. Her plan was to circle back to the northern route, once they were well out of the Tharks' territory. After an eventless day upon the dead sea bottom they camped beneath the overhang of an isolated rock outcropping. Their saddlebags carried only scant provisions, but Woola brought in a small creature which they roasted for an evening meal. The night was a peaceful one. In the glow of the dying campfire Dejah Thoris spoke: "We are surrounded by great dangers, John. Who knows what tomorrow will being? Helium may never know the debt she owes you. But tonight, my chieftain, I impart to you every token of her gratefulness. I am happy."